Kingfishers are colourful and interesting, and it is a great pleasure to hold one in the hand (Figure 1). Catching them also provides valuable data, and here longevity data will be highlighted (data that can only reliably be obtained from ringing efforts). There are 10 species in southern Africa, and the greatest longevity record is nearly 9 years, for a Brown-hooded Kingfisher, followed closely by Woodland and Giant Kingfishers both at 8 years. The most ringed kingfisher species is the Malachite Kingfisher, followed by Brown-hooded Kingfisher and African Pygmy Kingfisher, all species with over 2400 individuals ringed. The other kingfishers have less than 900 ringed each, with the rarer Mangrove Kingfisher at only 12 ringed. No Mangrove Kingfishers have been recaptured nor found dead, so this kingfisher has no longevity record. The longevity for the African Pygmy Kingfisher is not high, being close to 4 years. Partly this could be due to it being an intra-African migrant, and it is not retrapped often. The greatest distance moved for this species (based on ringing data) is 433 km, between Durban and East London. Kingfishers in Europe have reached an age of 21 years, which is substantially more than records for African kingfishers, possibly due to more ringing in Europe and greater efforts to recapture these birds. This shows that there is potential for much greater longevities in our kingfishers, especially as African birds usually reach higher ages than similar species in Europe. 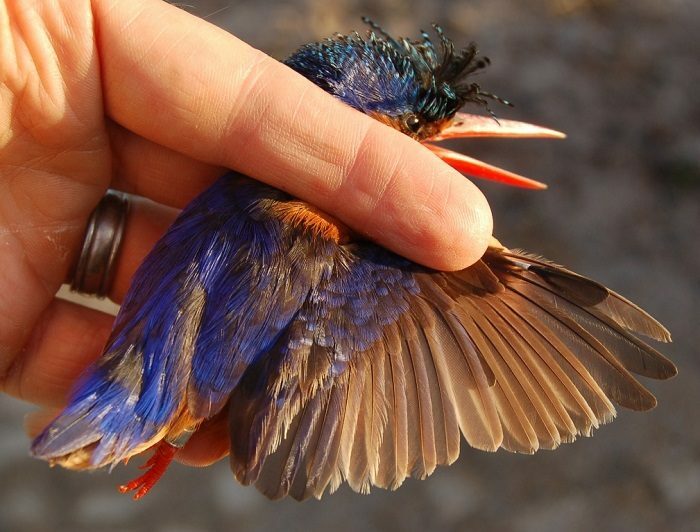 One of the kingfishers with the most number of recaptures was bird E16147 (Figure 2), ringed as an adult along the Ottery River in Cape Town, and recaptured 11 times thereafter, and becoming the oldest known Malachite Kingfisher. Unfortunately the ringing site was abandoned after the site deteriorated (dumping of rubble, and other factors), else the longevity record may have been a few years more by now (if the same bird was still alive and being caught). This also highlights the threat of habitat loss to kingfishers, and Malachite Kingfishers are sadly declining in southern Africa.